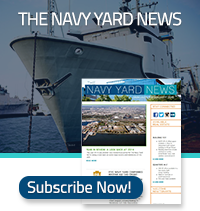 The Navy Yard is continually evolving as a more dynamic, vibrant, and progressive business campus. Explore some of the forward-thinking initiatives and projects currently under development. The Broad Street Entrance & Langley Avenue project is a comprehensive redesign of the Broad Street Gate, including the reconstruction of Langley Avenue. This project will be constructed in three phases and addresses an important priority of the Navy Yard: how to continue to increase and improve its vehicular, bicycle, and pedestrian access as the employment base continues to grow. The project was designed to minimize the disruption to everyone’s travel to the greatest extent possible by staging the work over a multi-year timeframe. The first phase involved the relocation of various utilities along Broad Street, some of which have been in place for more than 100 years, and was completed last year. The second phase involves repositioning the entrance to Langley Avenue where it meets Broad Street - from its present location along the Reserve Basin wall to the intersection with League Island Boulevard - and reconstruction of the entire length of Langley Avenue to 26th Street. Construction of this phase is underway and will be completed in summer 2018. The third phase of the project will involve a major reconstruction of the section of Broad Street from Langley Avenue, south to Intrepid Avenue, where the 130-year-old timber platform supporting much of Broad Street will be replaced, resulting in dramatically improved corridor. 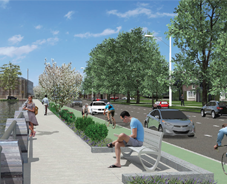 This new section of Broad Street will restore all four vehicle lanes, in addition to installation of a two-way bike path and elevated pedestrian walkway with new landscaping improvements along the Reserve Basin wall.